Not sure about the name the marketing wizards came up with, but here goes - it's Nordstrom's Half-Yearly Sale for women and kids! That rolls off the tongue, eh? Names don't matter when you're getting big discounts up to 40% OFF. 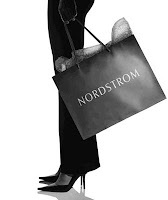 Bonus: Nordstrom offers FREE shipping and returns on all orders! That means women and kid clothing and shoes as well as handbags and accessories are marked down. For some reason they are also including select home items. I suspect these items must have flowers or choo-choo trains on them.